As far as I know, as-maintained SR 7's current north end is at SR 704, despite signage continuing north. But this may have changed recently. SR 15 (Okeechobee)'s north end is weird due to it being a normally-unsigned route. There is reassurance at the Martin-Okeechobee county line. So maybe we should end it (and SR 700) there, which is the FDOT district boundary. SR 50: HanRd should be added between US27 and CR455. This is a major Turnpike connector now that exit 278 is open. CR535 should be added between CR545 and DanRd. Maybe BluAve (former SR 439 north) between CR439 and FL408(1). FL527_S should be FL527_N. MagBlvd should be added between US17/92_N and BenRd to match SR 526 and SR 15 (Orlando). ClaSt should be moved west to CR13. SR 60: the west end is a bit east of the circle, but I don't remember the details. CR501 should be added between CR1 and US19. SR 84 extends a block east of US 1 (unless it's been truncated recently). I think SR 102 continues west to the airport. Why is SR 109 split in two? The overlap with SR 115 is signed 'to', and I know similar overlaps are included in TM. If I'm not mistaken, there's actually been a reconfiguration so both directions of SR 109 now stay on the frontage road. Does SR 112 actually continue west of FL953_N? SR 114 is signed (at least on I-95). Waypoints are FraSt (if we're counting interchange-related stubs like that), I-95, and Blvd. Why is SR 267 split in two? SR 405 is signed east from US1_S to the end at the JFK Space Center. 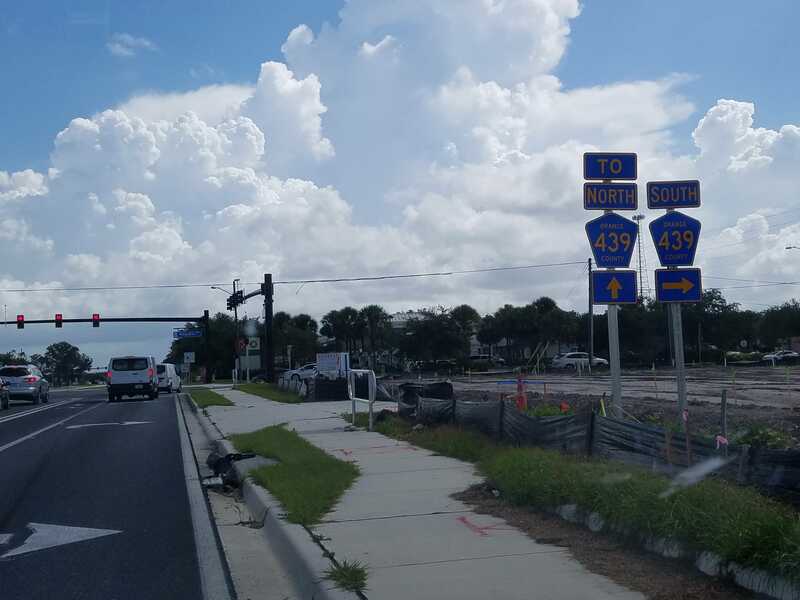 SR 414 has new interchanges between FL434 and I-4: GatDr, MaiSumBlvd, and KelRd (Lake Destiny Road will no longer have any direct access when construction is done). HopeRd should be WymRd. There's also a new exit 4B at Marden Road. SR 419/434: GarAve should be moved west to TusRd. SR 426: move OakHillDr west to WinSprBlvd? SR 436: the south end is north of CargoRd at the canal bridges. SR 482: as with other similar routes that end at interchanges with nearby roads (e.g. SR 421), the route extends west of I-4 to TurLakeRd. SR 524 continues east to SR 528. SR 586, SR 590, SR 686, SR 688: add CR501? SR 594 extends west to the eastbound end of I-175. FL US1AltJac FL115_S There is only one connection. Also, not sure about this but the Hart Expressway might be a popular route. It branches between US1Alt and US90 without a number (signed at least). US1Alt (Jacksonville) follows it then turns south two WPs short of the end. Would it be reasonable to include waypoints at Sans Souci Blvd on FL922 and US1? It seems to be a well used connector between the two routes (and, selfishly, one that I used last time I was in the area, leaving me currently unable to claim any of FL922) that Google Maps routes you on by default if making the south-to-east movement. This comes from the times that it was planned to include the full route of FL-115 (it's hidden there along US-1 Alt up to I-95). Otherwise, US-1 Alt's file could use some label cleanup and some other minor fixes. This system has been in preview for over a year. Is it awaiting any further review before activation? As I was driving down I-95 this afternoon, I saw that FL 9B was now open south of I-95 (apparently to CR 2209 [St. Johns Parkway], as the signs have a TO CR 2209 symbol). As I was already late for my appointment, I'll have to grab that section in a couple weeks when I go down that way again. Never mind. I didn't see any mention of it in the discussion above, but I do see that the HB has the extension open. Note that there is no other signage anywhere for CR 439 north (which is Bluford Avenue). A BluAve point should be added anyway, since it's a former state road. I noticed a “confusing” waypoint on the .list name FL FL616. Waypoint 1 (CR587/N West Shore Blvd) is labeled as ShoBlvd. I noticed when West Shore Blvd crosses FL US92 and FL FL60 both those pages label the waypoint as CR587. I think from a consistency standpoint the Waypoint should be changed to CR587. If not, then at least change the waypoint to WShoBlvd as N West Shore Blvd becomes S West Shore Blvd south of FL60. FL 590 (Clearwater) east end (waypoint is listed as SunPoiRd, for Sunset Point Rd. But Sunset Point Rd becomes Main Street once it gets into Safety Harbor, which it does at McMullen Booth Rd (CR 611). Wondering if the waypoint should be redesignated MainSt, even if it would break the 7 of us (including myself) who have clinched the segment. FL 243 now is listed on the BGS at the Pecan Park exit on I-95 (Exit 364). As the weather was bad, I couldn't see if there was a sign on Pecan Park Road itself (and there's still construction going on at the interchange; it may not be signed on Pecan Park yet anyway). FL 998 has apparently been added to the system, Campbell Dr in Homestead between Krome Ave (FL 997) and Dixie Hwy (US 1). It's signed, and FL 997 is no longer signed between US 1 and FL 998. I clinched FL 998 this morning, after doing the (old) length of FL 997 yesterday. If someone can verify this with FDOT data, perhaps the routes can be added/modified. Thanks for all the work, everyone! I can't think of too many missing points. Would love to see a lot of former state roads, but I think the county system might be a bit too much esoteric detail, and not all counties sign them. Never mind, you can't access the SLDs directly. Then select District D6, choose Miami-Dade, then scroll down to SR 998 (or roadway ID 87290000), and hit "Launch PDF".